John Joseph Haughton married Mary T. Nagle in circa 1893 Mar 7 y in 1900 census; her second mar. Mary T. Nagle married John Joseph Haughton, son of John Haughton and Ellen (? ), in circa 1893 Mar 7 y in 1900 census; her second mar. Blanche M. Haughton married Walter Eager. Margaret Haughton married Frank Tabor. Adella Richardson married Joseph J. Houghton, son of Samuel Houghton and Caroline Jenks, in Nov 25, 1884 at Ranchito, CA, USA, mar 16 years in 1900 census. 1920 Census 1920 Los Angeles, Los Angeles Co., CA, USA, age 29, single, electrician, engineering co.
Cyril Calvin Houghton married Eleanora Deiter. Lawrence Edgar Houghton married Louise Davis in circa 1921 age 26 and 20. Death Carrie died in her early 20’s without any children. 1880 Census 1880 Chico, Butte Co., CA, USA, age 35, a farmer; enumerated as the head. There are 15 other single men from all over, enumerated as laborers, and three Chinese cooks. Lake William Houghton married Julia Elizabeth Borden in 1878 at Downey, Los Angeles Co., CA, USA, he age 22. Lake William Houghton married Virginia Brooks in circa 1894 mar 6 years in 1900 census. Julia Elizabeth Borden married Lake William Houghton, son of James Daniel Houghton and Nancy Elizabeth Hastings, in 1878 at Downey, Los Angeles Co., CA, USA, he age 22. William Lake Houghton married Rae Gretchen White in circa 1911 age 22 and 19. Ella Houghton married (?) Dickerson. Stella Houghton married Herbert C. Gilman. Nancy Houghton married (?) Tuedio. Elizabeth Houghton married George A. Glover in Nov, 1906 he age 26, she 20. Catherine Dougherty married Miles Kenny Houghton. Emma Elizabeth Houghton married (?) Fitzgerald in circa 1908 age 30. Emma Elizabeth Houghton and (?) Fitzgerald were divorced before 1930. 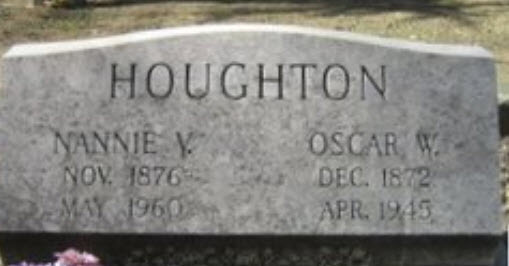 Oscar William Houghton married Mannie Virginia Flournoy in Aug, 1894 at Corning, Tehama Co., CA, USA, age 21 and 17; age 15 in 1910 census. Mannie Virginia Flournoy married Oscar William Houghton, son of Francis Houghton and Grace Williams, in Aug, 1894 at Corning, Tehama Co., CA, USA, age 21 and 17; age 15 in 1910 census. Grace F. Houghton married Omer E. Sutfin in 1915. Albert Jasper Houghton married Beatrice Scott in circa 1923 at Corning, Tehama Co., CA, USA, age 24 and 20. P. Houghton married M. (?) in circa 1862 mar 38 years in 1900 census.